Boom lifts are a type of aerial platforms generally used to lift up any person or object to reach at inaccessible places very easily. Boom lifts are generally powered by hydraulic machines and very useful in situation, where a person has to go at some inaccessible places. Boom lifts are usually vehicle or truck mounted and can move in all direction. Boom lifts are capable of working in situation like fire and flood to save peoples life. Apart from this, boom lifts are extremely useful in construction industries also. Boom lifts have a wide range of application includes aerospace, construction, and maintenance of telecommunication towers. Global boom lifts market is anticipated to witness a remarkable growth over the forecast period and is expected to flourish at a compound annual growth rate (CAGR) of 18.2% during the forecast period 2017-2024. Rising construction activities across the globe is expected to fuel the growth of global boom lifts market. 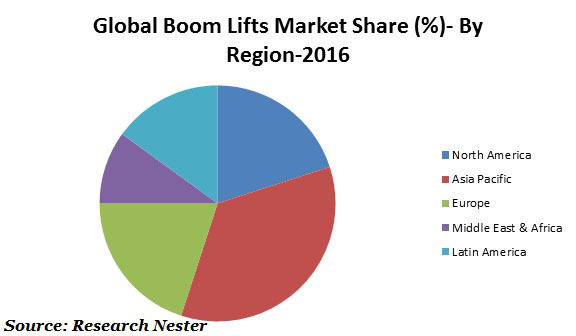 In terms of share, North America and Europe regions are major regional market of boom lifts. The regional boom lifts market of North America and Europe region are more mature and are anticipated to witness a slow growth over the forecast period. Moreover, Middle East & Africa region is also expected to witness a satisfactory growth over the forecast period. Global boom lifts market is driven by rising construction activities and need for over the globe. Formerly boom lifts are being popular in construction sector due to its flexibility and controls. Further, development of new telecommunication towers, skyscrapers and need for their maintenance are some major drivers anticipated to foster the demand for boom lifts in construction sector. Apart from this, boom lifts have a very wide range of application in almost every sectors including construction, aerospace which is expected to escalate the demand for boom lifts in near future. Further, boom lifts are known for their rough-terrain capabilities and technical developments with boom lifts to improve its quality and abilities have been attracting consumers towards it which are expected to foster the demand for boom lifts in near future. In addition to this, wide range of application and ability to work in difficult situation are also driving the growth of boom lifts market. On the other hand, steadily rising construction equipment rental services is a major driver to the growth of global boom lifts market. Many rental companies offer boom lifts on rent and this rental procedure is expected to foster the growth of global boom lifts market in near future. Rising construction activities in emerging economies and increasing investment in infrastructure development are fueling the growth of global boom lifts market. Further, major companies have been producing advanced boom lifts with higher capabilities and are expected to increase the demand for boom lifts in various end-use industries. However, end users of boom lifts prefer to maintain the existing boom lifts and do not invest in new machines due to their high cost. High cost of boom lifts is a major challenge which is restraining the growth of global boom lifts market.